ROGERS PARK — Monika Lee spent her summer being escorted by heavily armed police officers, traveling in mosquito-filled buses and hearing children cheering her name. Lee, a Loyola University junior-to-be and midfielder on the Ramblers' soccer team, recently competed for the Philippines National Team at the Asian Football Confederation Women's Asian Cup — a weeklong tournament in Dhaka, Bangladesh. Lee, 19, prepared for the event by practicing and living with her new teammates for two weeks in Manila high-rise apartments, and then returned to the country's capital city after the Asian Cup to stay with part of her family for seven days. "My dream since I was a little girl has always been to play Division I soccer, and it was never to play for the Philippines. Now I can't wait to go back," said Lee, whose mother, Nemone, is a native of the Philippines. Both she and Lee have dual citizenship. 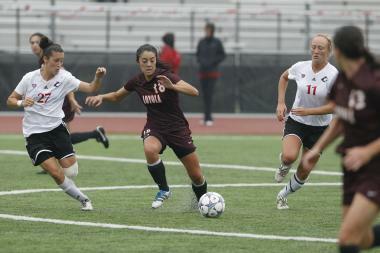 Loyola University Chicago junior-to-be Monika Lee, a midfielder for the Ramblers' soccer team, recently played for the Philippines' Women's National Team. Lee was born in the United States, and her immediate family lives outside Detroit. She said 16 of her 23 national teammates also are American with similar Philippine ancestry. Philippines head coach Ernest Nierras found Lee through a U.S.-based scouting service and asked her to try out for the squad in November. Via email from the Philippines, Nierras said he wanted Lee on the roster "specifically because of her aggressiveness and game presence" and "she is the type of player who will set up her teammates with good passes." Lee said she was excited when Nierras told her she had made the club, but more profound feelings didn't sink in until she arrived in Manila over the summer. "All of a sudden, I was being surrounded by fans and being interviewed," Lee said. "There were a lot of kids screaming my name: 'Lee! Lee!'" Bangladesh brought with it a new series of emotions. After flying to Dhaka overnight, Lee said the team was transported to a hotel by a "very dirty bus filled with mosquitoes, with a door you had to manually open and close that was locked by tying a rope around it." The next day — and every day in Bangladesh for that matter — Lee and the team had 10 heavily armed police officers taking them on and off their bus to practices and games, and back to the hotel. "There were five women on the right and five men on the left, all with bullet-proof shields and guns," Lee said. 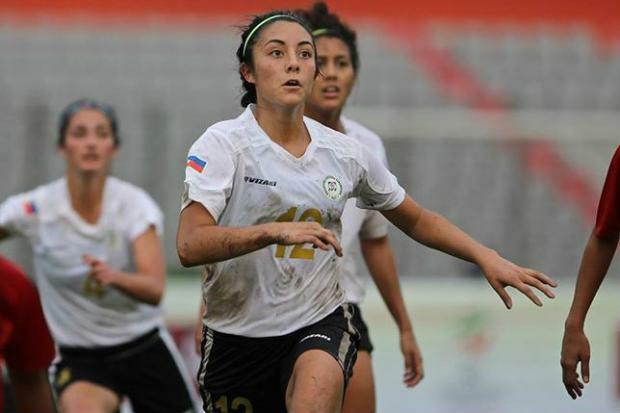 The Philippines was paired with Iran, Thailand and Bangladesh, with the winner of the group advancing to the next round of the Women's Asian Cup, a precursor to the 2015 Women's World Cup in Canada. Lee's squad beat Iran and Bangladesh, but a 1-0 defeat to unbeaten Thailand kept the Philippines from moving on. The overall experience was more important to Lee than wins and losses. Lee said it was fascinating to face the Iranians, whose players were covered in clothes from head to toe, with only their faces and hands exposed. During games, Muslim fans would stop watching and pull out mats to bow and pray toward Mecca. In the Filipino culture, she said women are treated as "fragile and not very aggressive," so Lee said it was an honor to play for the national team, which goes by the nickname "Malditas." "A Maldita is a 'bad girl' or a rough girl," Lee said. "We go by the phrase 'Battle and Bleed.'" Lee, who started against Iran and Thailand, is still part of the national team, and Nierras said he expects her to be "playing for the Malditas for a long time." "We need more players like Monika," Nierras said. "Her attitude is very positive." She also has two years remaining with the Ramblers, for whom she's scored five points in 34 career games. Loyola coach Barry Bimbi said Lee's trip overseas will help her become a more complete competitor and person. "I think Monika got a glimpse of what doors soccer can open in someone's life — whether that be traveling to different countries, or touching people's lives that you only meet for a brief moment in time," Bimbi said of Lee, the first of his Loyola players to ever make a national team. Lee still talks to many of her Philippines teammates every day. And she called her journey to Asia "very rewarding and very humbling." "I just had an amazing time," she said.